What differs science from pseudoscience? Why do we call astrology, numerology, and feng shui pseudoscience? New Age followers frequently claim that science-fans are simply too arrogant and ignorant to look at the evidence, but how true is that? Here, I contrast the scientific method and the pseudoscientific method, and show why we sceptics are justified in labelling them as simply superstition. Scientific theories are self-correcting, that is, they change in the light of new, contradicting evidence. As a perfect scientific theory should have zero flaws, it is not surprising that what you’ve learned today may be completely wrong tomorrow. Take the Theory of Evolution as an example. Initially, there was Lamarckism, a theory stating that changes in an individual’s genotype will be inherited by its offspring. Yet, the arrival of genetics on the scene completely rendered the theory wrong, and gave overwhelming evidence for Mendelian-inheritance. Yet, by the early 21st century, it was found out that organisms don’t follow strict Mendelian inheritance patterns. This can be caused by epigenetics, environmental factors etc. In fact, in 2006, Minoo Rassoulzadegan from the University of Nice-Sophia Antipolis, France, and her colleagues reported the first instance of non-Mendelian inheritance in mammals. They interbred wild-type mice with heterozygous with engineered Kit DNA. The wild-type mice had tails uniform in colour; the heterozygous mice had spotted tails. When they interbreed the mice, they got a litter full of spotted tail mice when Mendelian inheritance expected about half of each mice. 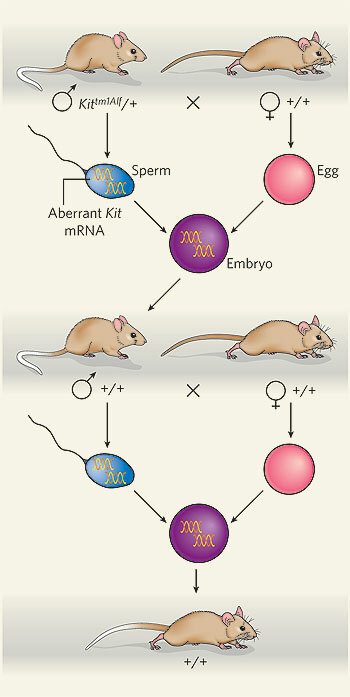 They found out that the Kit mRNA in the heterozygous mice and the pups was lower in level and degraded, and the degradation was caused by Kit microRNA. This shows that DNA (RNA in some viruses) is actually not the only biochemical that affects inheritance, and once again, the Theory of Evolution needs to be updated. But what about pseudoscience? Do they revise their theories in response to contradictory evidence? No, they don’t. Astrology, feng shui, numerology rarely update to reflect new findings, and is virtually the same as what they were thousands of years ago. The failure of Western astrology to address the precession of the equinoxes is a classical example and typical of pseudoscience. See my post - Debunking Astrology (Part 2 – Problems that Astrology Must Answer) for further info. I don’t dare to say science is without fraud. Piltdown Man, Nebraska Man, Archaeoraptor etc. are examples we can all remember as embarrassments to the scientific community, a sore reminder that science must be honest to itself, and to be critically peer-reviewed. A defining feature of science is that any single hypothesis must go through extensive scrutiny from the respective scientific communities before it even has the hope to be published in a scientific magazine, like Nature. With all those different hypotheses coming from everywhere, one has to ensure that they are truly of high quality, and it is the peer review system that allows us to judge whether a hypotheses is honest and truthful. But, does pseudoscience have similar systems? Definitely no. Pseudoscience goes directly to the relatively uncensored mass media, telling the world of their “great” discoveries and predictions, in which they cannot give any evidence for. But what’s more disappointing is that quite some newspapers will praise their claims without second thought? Perhaps because of psychological and marketing factors? Whatever it is, the conclusion would be: pseudoscience never examines its claims critically, but it speaks louder than true science. Like a duck compared to an eagle. A theory that explains everything explains nothing. Science hypotheses, theories and laws must be falsifiable. What do we mean by falsifiability? It means that a theory/hypothesis/law must be specific and objective in its predictions so that they can be test and verified by other scientists. Here’s an example: Mendel’s Law of Segregation predicts that there are dominant and recessive alleles, and when both are present, the dominant allele will be expressed, masking the recessive allele. This was strongly supported when Mendel’s pea experiments showed a 3:1 ratio of 2 different traits, 1 being dominant and the other being recessive. Except in cases where non-Mendelian inheritance is involved, this law has always stood up to the test, and can thus be rightfully called a scientific law. That’s for Capricorn. Wow, doesn’t this sound like the perfect employee/employer? Note how does astrology (and also other pseudoscience) prey upon our dreams and visions so that we happily agree with it. Moreover, the prediction above only explains a part of our life. One can look at a Capricorn sign and say that it fits his/her work-life, and look at an Libra sign and say: “That’s me! Charming, attractive, graceful! After all, that’s what I am in my personal life!” By making predictions which could apply perfectly depending on the situation, pseudoscience manages to be “accurate” in its predictions, when it is simply using the same-old tactic. To allow your theory/hypothesis to be verified accurately by other scientists, what you need to do is to use the most precise, and the clearest words possible. They can then be verified using scienitific experiments, which will determine its validity. That’s needed so that science remains objective and falsifiable. However, it seems that a lot of people frequently criticise science for using hard-to-understand jargon in place of general, understandable words. But be aware that when I say clear, I don’t mean easily understandable by the general public, but precise enough so other scientists can know exactly what are you referring too. This is how it is in the scientific community; on the other hand, more simple and generic words are used when informing the public. But pseudoscience also uses the same words, so does that give it the same qualities? That’s a no. Take a look at the some “scientific” mumbo-jumbo used by pseudoscience: “energy vibrations”, “enhanced bio-field”, “non-Hertzian scalar energy”. Despite using scientific sounding terms, such terms don’t exist within the scientific community, as their existence have never been proved. Thus these terms are meaningless, nothing more than a trick to sound genuine to the public. In other cases, pseudoscience will quote mine true and valid scientific theories to further their case. Take the notorious FusionExcel company as an example. The say that their “quantum pendant” are capable of generating “scalar energy”, which are supposed to improve our wellbeing. But wait! In physics, the word quantum is used to describe quantum mechanics, which is currently the best system for explaining interactions on the atomic/subatomic scale. Are they implying the pendants are created through manipulating molecules on the subatomic scale? And what is scalar energy? They try to use the Maxwell Equations to validate its existence, but I cannot find any link. That’s typical of pseudoscience. A scientific theory must stand up to the evidence consistently. It must always match real-world observations, and the whole theory could be dismantled with one contradicting evidence. That’s why scientists constantly test scienitific theories against new observations to ensure its validity. If it doesn’t hold, then try to create a better one. But pseudoscience never does this! They keep on giving vague, generic predictions, and in the case that even those predictions fails, they usually give some kind of rationalization, such as “The theory is just a guideline”, “Well you shouldn’t rely only on stars signs, there’s more to astrology”, “Maybe you missed something”, “You can’t judge someone from his/her looks” etc. Never do they admit to be wrong. On the other hand, pseudoscience gets ecstatic when their claims are found to be true. They will declare it as empirical evidence, while ignoring the times when the predictions have failed to hold. It is of course frequently shown that these “evidence” can also be explained through pure chance, which may be why believers don’t look at contradicting observations. In psychology, this is known as confirmation bias, in which people deliberately ignore contradicting evidence, in favour of supporting observations. While commonplace in pseudoscience, confirmation bias in the scientific community is quickly exposed thanks to the peer review process. The last, and most annoying feature of pseudoscience is its overuse of anecdotal evidence. Science is empirical, requiring strong evidence and repeatable, testable predictions. Just because a well respected scientist or the majority of scientists claim something to be true doesn’t verify a theory/hypothesis. It must go through the peer review system as stated above, and be tested repeatedly to be valid. But obviously, pseudoscience doesn’t do this. As evidence can’t be found for their claims, they instead rely on anecdotes from customers or supporters. When I asked my friends for evidence of ghosts, they say: “I saw it! It was late night in my camping tree, and I saw a spectre in the trees”, “I hear weird sounds sometimes!” or “My friend them, I saw them, doesn’t that make ghosts true already?”. Classic example of pseudoscience/superstition. But why not anecdotal evidence, you ask? The problem with anecdotes is that human errors are simply too frequent, we have great imagination, we all have slight confirmation bias, and yes, the placebo effect is quite a powerful force. This problem exists even in mass hallucinations, where the power of suggestion can cause a group of people to have “God” show up in front of them, when spectators see nothing except for a bunch of lunatics. Anecdotal evidence cannot be used as scientific evidence for this reason. 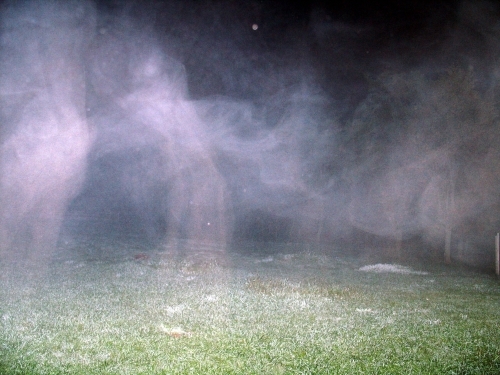 I saw a vaguely-humanoid shaped fog: Evidence for ghosts! I think I’ve given enough reasons on why pseudoscience is pseudoscience. To sum it up, it’s dogmatic, unverified, untestable, and relies and anecdotes and confirmation bias. So stop claiming that we sceptics are close minded. How about this, believers – review your claims. Perhaps you’ll find out that those superstitions aren’t that factual after all. The Pseudoscientific method is best described with "Make something up, cover ears, cry and repeat: 'I am right, i am right' over and over again." Well, well. Isn't that the religious method as well? It seems that dogmatic thinking is human nature, else why does it work so well? Interesting post. The point about how pseudoscience tends to go straight to the mass media rather than working through the normal nonsense-filtering mechanisms of science is especially striking with creationism. Creationists avoid mainstream peer review and work by press releases, stealth candidates for school boards, etc. No valid scientific revolution in history worked that way. Another difference is that scientists start with the evidence and try to figure out what conclusions follow from it, whereas some forms of pseudoscience start from the desired conclusion and try to find evidence to support it -- certainly in the cases of crerationism and global-warming denialism. True, but that can't be helped. After all, if they really went through the peer-review system before publishing their findings, I don't think we'll ever get the chance to hear the "Intelligent Design" theory. I like your blog a lot. This article was very good. I appreciate true science being a competitive endevour, with the aim of finding truth through merciless critiques and analyses of theories and hypotheses. It really is only through this and the careful use of the scientific method that we can get as close to truth as possible. Keep up the great work on your blog! Thanks, TSA! Your blog's great, too!